In Charles Dickens’s novel “A Tale of Two Cities”, set during the French revolution of 1789, he draws the character of Madame Defarge. She, along with other members of the Tricoteuse, the knitting women, perch every day next to the guillotine, knitting into hats and socks the names of those to be executed, while watching the upper aristocracy and upper bourgeoisie being dispatched to their death one by one. They were regarded as respected sisters of the revolution. 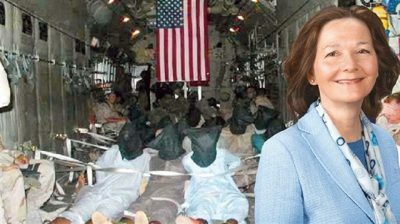 I cannot help being reminded of her when I read the CV of the woman nominated by President Donald Trump to be the new head of the CIA, Gina Haspel. She is a career officer who ran a CIA “black site” in Thailand. She implemented the torture policies of president George W. Bush. She also, according to The Economist, transmitted her boss’s orders to destroy video evidence of brutal interrogations. When the allies captured high-ranking members of the Nazi government and German generals, they wanted all the information they could get. They got most of it but they never used torture. What Bush, with the connivance of Haspel and her like, did would never have been allowed, yet the stakes then were much higher. Immediately on attaining office, president Barack Obama banned torture. In sharp contrast during his campaign, Trump said he favoured bringing it back and a “hell of a lot worse than waterboarding”. Contradicting him, his secretary of defence, General James Mattis, says he does not believe in torture. He argues that he could extract from a prisoner the information needed with two chairs, a packet of cigarettes and a couple of bottles of beer. The Mattis line follows the arguments of the 2014 report of the US Senate that examined, among others, the torture of the 9/11 mastermind, Khalid Sheikh. He was waterboarded, which gives the sensation of drowning, 183 times. The report concluded that the information extracted from him could have been learnt without torture. Primitive man, like other animals, followed his instincts and killed his enemy as swiftly as the job could be done. Archaeologists, examining skeletons, have found no evidence of torture. For several hundred thousand years, torture did not exist. Only in the last few thousand has it become a weapon of state. Rome tortured the early Christians. The Christian church repelled by this Roman practice, for a thousand years used its great strength to abolish torture. Until the time of Pope Innocent IV in the thirteenth century, it was practically unknown in the Western world. The Inquisition brought it back. Heretics were forced to undergo a very systematic use of torture, while a magistrate sat close by logging carefully the instruments used. In the 17th century, torture began to die out. In 1640, it was abolished in England by law. After the 1789 Revolution, France made the use of torture a capital offence. Most German states and Russia abolished it in the nineteenth century. Moreover, the European imperial powers did much to dampen its use in the many parts of the world where they had their empires. During the twentieth century, torture returned with a vengeance. It reached such a scale that it dwarfed even the darkest Middle Ages. It was Mussolini’s fascists that were the first government to make torture an official policy. The blackshirts invented their own particular brand of torture; pumping a prisoner full of castor oil “to purge him of the will to exist”. The German Nazis not only developed the concentration camps for mass extermination of the Jews, gypsies and homosexuals, they regularly used torture. Spain, under Franco, used torture until the 1970s. As late as 1981, Spanish police were found to have used torture against Basque nationalists. In the United Kingdom during the civil war in Northern Ireland, torture was used in the 1960s and early 1970s mainly against the IRA. Hooding, loud, high-pitched noise, sleep and food deprivation were the main tools. It was uncovered by Irish newspapers and triggered a great row in Britain. Eventually it was banned. In 1972, Amnesty International launched a campaign, supported by the Scandinavian countries and Holland, to abolish torture. But it took until 1984 to win a UN legally binding treaty. Bush and Trump have ignored it. So did the British government of Tony Blair. With people like Gina Haspel in charge of the CIA, we can assume the worst. The Senate must not confirm her in office.